When you’re expecting, you plan for everything. You buy 20 different bottles, get at least three flanges for your pump, make sure you have ALL the options for swaddle blankets, and stock up on cute onesies. 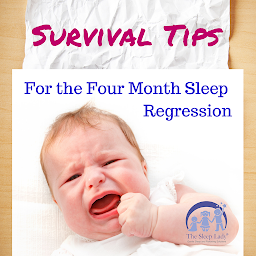 But as much as you may prepare, there is nothing that can prepare you for the amount of sleep deprivation that you will likely experience during the first 12 to 16 weeks of your baby’s life. Sure, while you’re pregnant, you are uncomfortable, which makes sleeping a challenge. I think that many moms fail to realize that this is nature’s way of slowly easing you into the world of your newborn. Let’s face it, it may feel like someone is tossing you into the sleepless pool with no warning, but your body has been preparing you for months, literally. Now, I’m not saying that sleep deprivation is a good thing. It’s not. In fact, a lack of sleep can definitely contribute to the “baby blues” and is not at all helpful if you’re dealing with Post Partum Depression. Unfortunately, your baby doesn’t know any of this. You may have seen a recent article and news story highlighting a “new” method to help your newborn baby sleep through the night. Interestingly, the parents admit that their baby was agitated and that using this method seemed to upset him. This SHOULD have made them take a pause and think about what a newborn’s actual needs are. In fact, stretching feedings may work for some babies, but for the majority, it just results in a lot of crying, which is stressful both for the parent and baby. Newborn babies have very small stomachs. This is not an exaggeration. It’s not until about 4 weeks that your baby’s stomach will be the size of an average egg, at which point she can eat between 2.5 to 5 ounces at a stretch. While this need may not be food, it can be a dirty diaper, gas, reflux, or even that she simply wants to be safe and snuggled up with you. Remember, your newborn is not capable of self-soothing yet. She is relying on you to do that for her until she’s old enough to learn this skill, which usually happens between 4 and 6 months. Newborn sleep is it’s own special study, and it’s very, very different from the sleep of a 4 to 6 month old. As a newborn, your baby is still figuring out the difference between night and day, and has not yet developed the ability to put herself to sleep. This is normal and healthy. Sure, some babies are immediately able to sleep longer stretches, but most babies will wake to feed every 3-4 hours during the night, sometimes more if they are in the middle of a developmental leap or a growth spurt. Knowing this, it’s important that you figure out a way to get some sleep. Many parents take shifts or sleep when baby naps during the day for the first 4 to 8 weeks. Ideally, split the night into two 5-hour stretches (mom taking the first 5 with baby and her partner taking the next portion of the night) so that you are not so tired. You may feel tired when the sun goes down, but your new baby doesn’t. That’s because newborn babies have not yet developed a circadian rhythm. This rhythm is what helps us sleep and wake at “normal” times. Most babies begin this development around 12 weeks, but your baby’s circadian rhythm will not be fully developed until around 6 to 8 months. Does your newborn baby nurse to sleep? That’s perfectly fine. She will only nap in the swing? No problem. She wants to eat every 90 minutes during the day? Great. You really are not going to create any “bad” habits in these first few months. Do what works for you and your baby now, so that you can rest and your baby can get the sleep (and feedings) she needs. Being a parent is a big, exhausting job. You are going to be tired, but remember, your body has been slowly preparing you over the past 9 months for this. Keep in mind that this phase is temporary. It’s not going to be long before your baby is sleeping longer stretches, and taking naps on a schedule. So enjoy this time, as tiring as it is. Share your questions and stories with us on The Sleep Lady’s Facebook Page. Supporting each other makes parenting so much easier!